I call the purple beam! The Raiden series is perhaps my favorite SHMUP series of all time, blending fast paced gameplay, slick sprite graphics, and a smooth upgradeable weapon system. 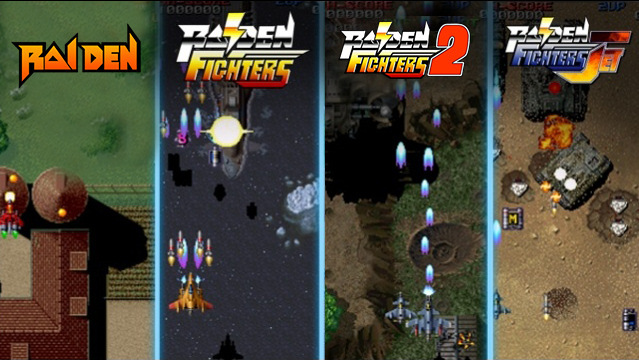 Earlier this year publisher DotEmu released iOS and Android versions of Raiden Legacy, a collection of four classic Raiden SHMUP games. This collection is similar to the Xbox 360 version of Raiden Fighters Aces - but includes the classic original Raiden game. Sadly, Raiden 2 is still missing from the lineup. Now Raiden Legacy is available for the PC and Mac but with one major advantage over the portable versions - full local co-op support for two players. The game can be purchased DRM free directly from DotEmu for just $9 or you can snag it from Amazon for $10. This version of the game offers full gamepad support as well as portrait or landscape modes (for that classic arcade feel). The soundtrack has been remastered and if you're too lazy to keep pressing the button - there's auto-fire. Seriously, if you're a SHMUP fan, do yourself a favor and grab this pack - then invite a friend over for some co-op goodness. Page created in 1.9736 seconds.